Having a couple of friends roaming freely around the home is commonplace in most homes. Children and adults enjoy the close interaction with pets that bring comfort and joy in equal measure. According to the National Center for Health Research, companion animals help to improve health by lowering blood pressure levels and regulating the heart in the event of stressful situations. Family pets promote an active lifestyle among kids as they spend time playing inside the house or in the yard. The first order of business in dealing with pet odor in the house is identifying the source of the smell. Pet odor arises from habits like lying in excrement, rolling in the mud or dead animal remains. The smell can also emanate from simple routines like bathing then forgoing drying. Microorganisms thrive in the fur of animals like dogs and cats. There is hardly any smell as long as the animal stays dry, but once the dog takes a bath or dives into the pool, the water releases these sticky compounds leading to an awful stench. Mouth odors can be a sign of infection inside the mouth, and this smell can linger in the home for days. Some breeds like Bulldog or Pugs are prone to skin fold dermatitis that cause foul odor underneath the folds. 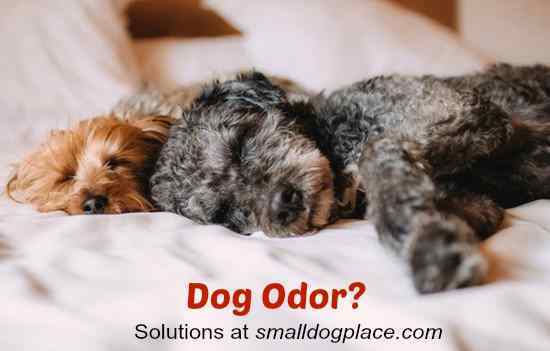 Bacterial and yeast infections are other sources of the bad smell that quickly spreads in a home if the animal is allowed indoors, particularly in close quarters like apartments. There are cases that my dog brings his food to another room and just leaves it here. Therefore, try to avoid this bad habbit by just feeding your dogs at some location in the house. Since we have established that pets are mostly responsible for the bad scent they leave behind, it is imperative that you observe a consistent cleaning habit to keep the animal as clean as possible. Animals love to play in the mud during the rainy seasons so you may have to wash them more often than in the dry season. Alternatively, you can control their playing habits by sequestering them to a corridor or other empty room in the house as opposed to playing in the yard. Bathing your pet should go in tandem with cleaning up their sleeping area. Make a habit of inspecting the dog kernel several times through the week to see if they have created a mess. When this happens, take out the soiled bedding for cleaning or drying in the outside if the weather allows. You can also hand wash the blankets by first soaking in hot water to kill pathogens followed by air drying. To make your work easier, use removable covers so that you can replace with a clean one pending laundry. Vacuum the bed to remove hairs, fur, and other debris that may have transferred from the environment. Cleaning up after pets does not have to make a dent in your monthly budget. There are plenty of solutions that you can make using common ingredients used in homes. For instance, white vinegar is a natural deodorizer and has proven performance in removing urine stains on the carpet. Spraying a combination of vinegar and baking soda helps to remove any lingering smell of urine after the deep cleaning process. 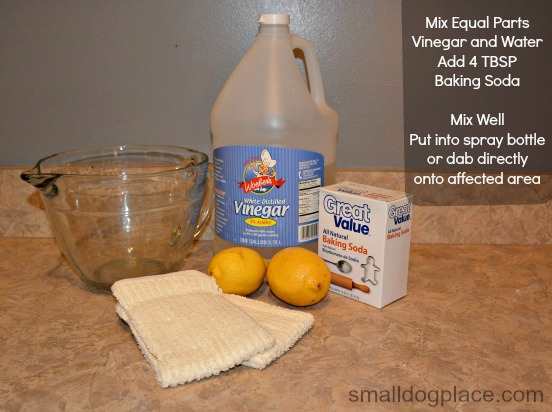 Try this formula by mixing equal parts of white vinegar and lukewarm water in a pot or bowl. Add four tablespoons of baking soda and pour the mixture into a spray bottle. Shake thoroughly to allow blending before use. You can also use solutions from citrus fruits like lemon, orange, and grapefruit to get rid of dog odor. If family pets wreck havoc on the carpet, cut a lemon in half and dab gently on the rug to remove urine stains. If the bad odor persists even after washing the animals regularly, it is time for more stringent measures like setting up a designated play area where the kids can interact with family pets while barring access to other rooms such as the living room and bedrooms. This restriction helps you to know when and where the mess occurs so you can clear it without wandering around the house to identify the source of offensive smells. If you have a basement, ensure that the door stays shut to keep pets away as they may accidentally potty here without your knowledge. Getting rid of pet odor from the house requires a combination of washing pets, airing the bedding, and rules to contain physical activity within a given area. If your budget is tight, homemade solutions can help remove stains on the upholstery or rug. I'm Brenda Leary. I have a passion for dogs. My ambition is to found a community for dogaholics that everyone could share useful knowledge about dogs. I'm here to break down all the complex dog's tips/advice and try my best to give you the stuff that actually useful and works! Follow my steps at Cuddle Your Dogs or visit me on Facebook to discover dogs' daily routines, tips, and advice on caring a dog/puppy and many many things about this beautiful world.